This is an example of a typical BeamClamp® assembly used to connect two steel sections together. The assembly consists of a pre-drilled location plate  inserted between the two steel sections. 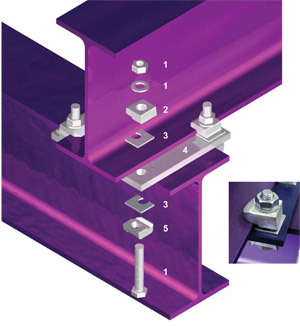 An upper set of BeamClamp® components  clamp down on the lower flange of the upper beam while a lower set of components  work in the opposite direction, clamping the underside of the upper flange of the lower member. Additional packing shims  may be used to adjust the clamp to the thickness of the flange being connected. The connection is secured by inserting a bolt  through each of the lower clamps, the location plate, the upper clamps and then tightening a nut to the recommended torque. 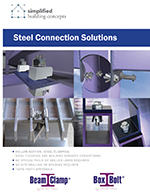 All of the important details about steel connection solutions in a print-friendly format. The catalogue contains technical data, installation tips, and a detailed cost analysis.